PYC bearing is a specialized manufacturer of various instrument bearing,instrument bearings,instrument ball bearings,instrument ball bearing. The inch series miniature bearings are single row ball bearings available from .0400 through .7500 inch bore sizes. The construction of these bearings enable them to carry moderate radial and thrust loads at low operating torque while providing high performance within a small envelope design. Miniature and instrument bearings are available in stainless steel for those applications requiring corrosion resistance and chrome for maximum fatigue life. Our miniature and instrument bearings of both the metric and inch configurations meet the tolerances of ABMA Standard 20 for ABEC 1 metric series bearings. 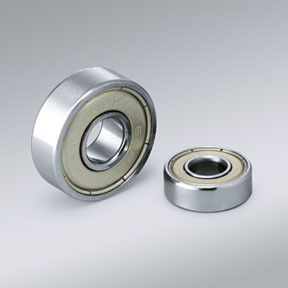 Stainless steel or chrome steel bearings are available with crown or ribbon type metallic cages. Open or shielded bearings may be flanged or unflanged. Various types of seals may be specified depending upon the anticipated environment to which the bearings will be exposed. * Extended inner rings and flanged outer rings to facilitate mounting. * Shields and seals for contamination protection. * Various ball retainer styles and materials for optimum bearing performance. * Factory lubrication from a stock of several hundred lubricants. * Ring and ball selection choices include AISI 440C stainless steel, SAE 52100 chrome steel, beryllium copper and ceramics. * Performance testing for noise and friction torque specifications available.